Welcome back to our discussion of Speed in Wingsuit BASE. In part 1, we built an academic framework defining the sensitivity of available lift (AL) to speed. Numerically, more speed = more AL = more life margin. The most important takeaway from Part 1: Any speed decrease can kill your Available Lift in seconds. When you run out of AL at low altitudes, you risk joining our friends on the Base Fatality List who have done the same. Originally, this was going to be a 2-part series. However, to present a more comprehensive discussion, Topgunbase has collaborated with Matt Gerdes to present what will now be a 3-part series. Part 2 will continue pulling the thread on the academic side of speed. We’ll present some precise terms needed to standardize terminology in the wingsuit community. We’ll dissect the components of what could be called an ‘old school’ speed configuration. In Part 3, authored exclusively by Gerdes, we’ll hear thoughts and techniques used by today’s leading wingsuit competitors, techniques that you can start practicing on your very next wingsuit flight. “Arms back”… what the hell does that mean? Before we jump into a discussion of Speed Techniques, we need to clear up a pet peeve of mine concerning incorrect terminology. It’s the lazy and inarticulate use of the phrase “Arms back.” I hate that term. Routinely thrown around by competitors, coaches, newbies and everyone in between when discussing wingsuit arm inputs, “Arms back” is inadequate, incomplete, confusing and misleading. “Arms back” could mean any number of arm positions depending on who’s doing the talking or listening. We’re going to replace “Arms back” with two separate and distinct terms, DIHEDRAL and WING SWEEP. DIHEDRAL: When in the flying position, raising your wing tips above your wing roots. Raising your grippers or wrists higher than your shoulders. Dihedral is great for roll stability about our spinal axis. How does it work? With an angle of bank, the low wing tips into the horizon creating an increased vertical lift component. The high wing tips further away from the horizon creating a decreased vertical lift component. This lift differential creates an auto-balance to help level your wings. Aircraft designers use dihedral to create incredibly stable aircraft. 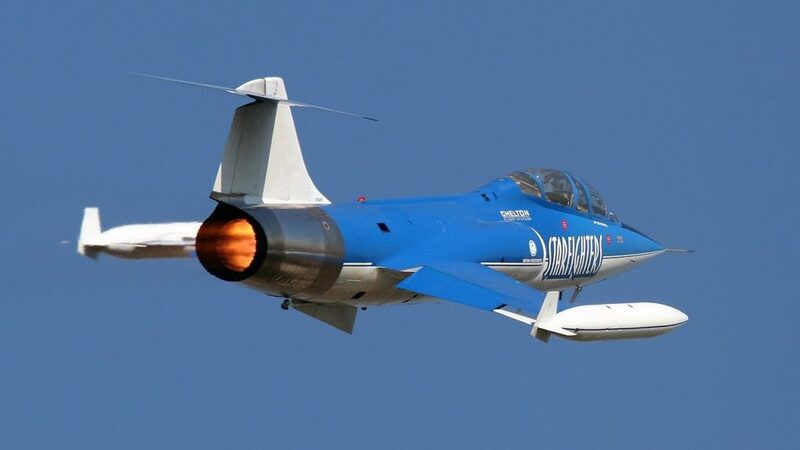 Aerobatic aircraft, on the other hand, use zero dihedral for maximum agility, at the cost of flight stability. Remember, nothing comes for free in aerodynamics. Think Red Bull Air Races. These aircraft are intentionally designed to roll faster than a greased ball bearing. It takes more skill and effort to fly precisely with zero dihedral. 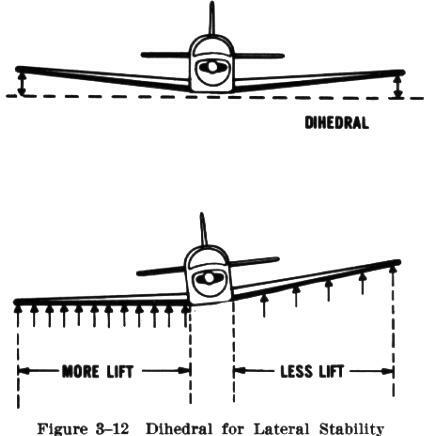 Anhedral (or negative dihedral) is usually indicative of minimal lateral stability and impressive roll agility. Generally requires a flight stability computer or two for any hope of decent human control. Usually only employed on supersonic fighter jets. Nature also adheres to aerodynamic principles. For instance, have you ever watched a pigeon in gliding flight? They like to glide with massive amounts of dihedral. Pigeons are also terrible gliders. Don’t fly like a pigeon. On the other side of nature’s aerodynamic spectrum is the swift, a supremely agile bird capable of flying an airborne pretzel maze at Mach 2. They routinely glide with a signature anhedral (or negative dihedral) wing profile, giving them superior flight agility. Aircraft have a fixed dihedral tailored to a design flight profile. Wingsuits, like birds, are quite different. We have variable dihedral geometry and multi-pivot articulation (I made that fancy verbiage up, but essentially, our arms can flap in all directions). For us, dihedral is an EXTRA flight control input unique to wingsuits, affecting roll stability, dive stability and speed, all in different ways. More on that to follow. WING SWEEP: For wingsuits, wing sweep is defined as the angle formed by the leading edge of your arm relative to the axis formed by your shoulders. 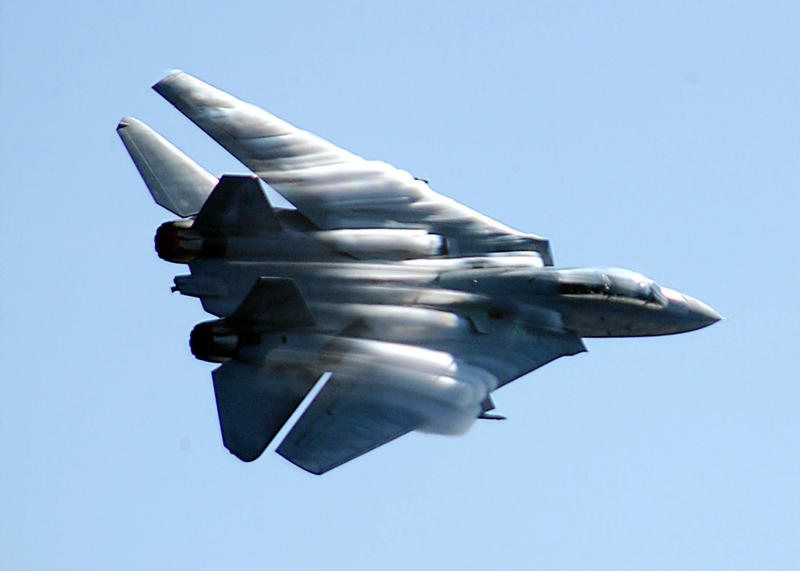 The F-14 Tomcat, famous for its variable wing sweep geometry, employed a forward wing sweep limit of 20º, used for slow speed flight, takeoff and landing. 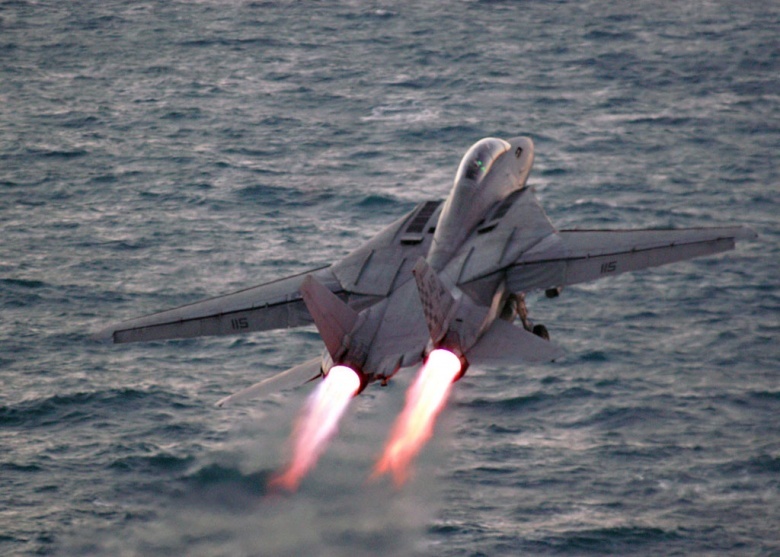 Aft wing sweep limit on the Tomcat was an impressive 68º, automatically programmed aft above Mach 0.7… or manually programmed aft whenever you wanted to look cool. 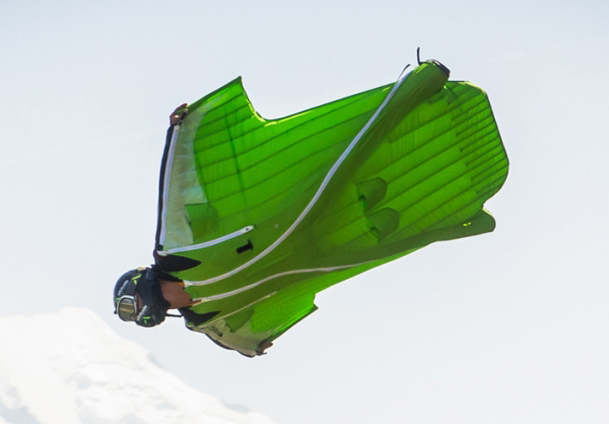 For wingsuits, there is an obvious design ‘wing sweep signature’ particular to each make and model. Race suits seem to be designed with more aft wing sweep than most, but the speed benefits are not necessarily guaranteed by merely incorporating an aggressive wing sweep angle. Variable wing sweep affects a bunch of inter-related aero variables, such as center of gravity (CG), center of pressure (CP), effective surface area, stability for pitch/roll/yaw, and, you guessed it, speed. One of the secrets of the now retired and de-classified F-14’s wing sweep capability involved a deflating airbag mechanism which created a cavity in the fuselage for retracting wing structure to occupy. When airspeed decreased and the wings swept forward, our secret airbag inflated to streamline the void left by the extending wing structure. For wingsuits though, manually sweeping our arms aft of the design sweep generates a billowing of excess wing fabric that can’t be effectively retracted out of the airstream. Huh… can that possibly be a good thing for speed? Well, yes and no. Aft wing sweep for wingsuits is nothing more than a distortion-induced, lift-dumping method to steepen your flight path. Sure, at the end of a dive with your arms pinned by your side, you may be vertically burning through the air at the speed of heat. And with some practice, that increased kinetic energy can be converted into an amazing flare. But an aft wing sweep dive burns up massive amounts of altitude that could have been more effectively used to actually fly somewhere other than down. Don’t get me wrong, exercising aft wing sweep is one of many tools that must be mastered by all wingsuit pilots. However, use of aft wing sweep in the BASE environment must be tempered with judgment. Aft wing sweep input can help stabilize high vertical speeds. However, extra aft wing sweep induces fabric-billowing drag that hurts horizontal speed and distance. There are other methods of diving that keep your wing in a more efficient configuration. Matt Gerdes will discuss his thoughts on current competition-level speed techniques in Part 3. What’s interesting about using correct terminology is quantification is now valid. Dihedral and Wing Sweep are both measurable in angles of degrees relative to a defined axis. Excellent! Now we’re talking about the same thing to everybody, everywhere. And yes, since our arms can pivot on multiple axes, Dihedral and Wing Sweep can and often are used at the same time for us wingsuiters. Okay, rant over. “Arms back” is out. Dihedral (Zero/Positive/Negative) and Wing Sweep (Aft/Forward) are in. Aerodynamics is a science of compromise. Aircraft are usually designed to do one thing really well, at the cost of everything else. For example, airliners are designed to minimize specific fuel consumption, loosely translated as the least amount of fuel burned to fly one unit of human/cargo one nautical mile. To realize this design goal, airliners are unable to climb vertically, pull 10 G’s or land on aircraft carriers. You can’t have everything. From our ‘WTF are we really doing?’ discussion, we all remember that wingsuits are stupidly low efficient gliders, right? 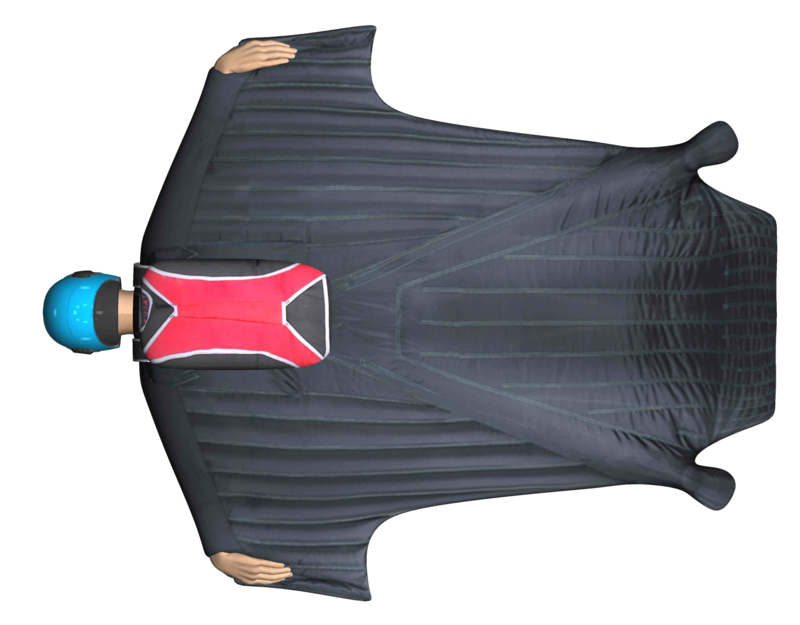 Wingsuits are designed to a best-case planform for a specific set of flight characteristics. Even then, with our human anthropomorphic constraints (T-Rex arms), we just don’t have much to work with. So, just from a common-sense approach, why on earth would you want to intentionally distort and de-tune your wingsuit? Dihedral is distortion. Any additional aft wingsweep is distortion. Dropping your knees is distortion. Letting your grippers weakly trail in the free stream is distortion. Flexible-airfoil, inflatable flying devices really don’t like distortion. Distortion generates performance-robbing drag. It’s that simple. 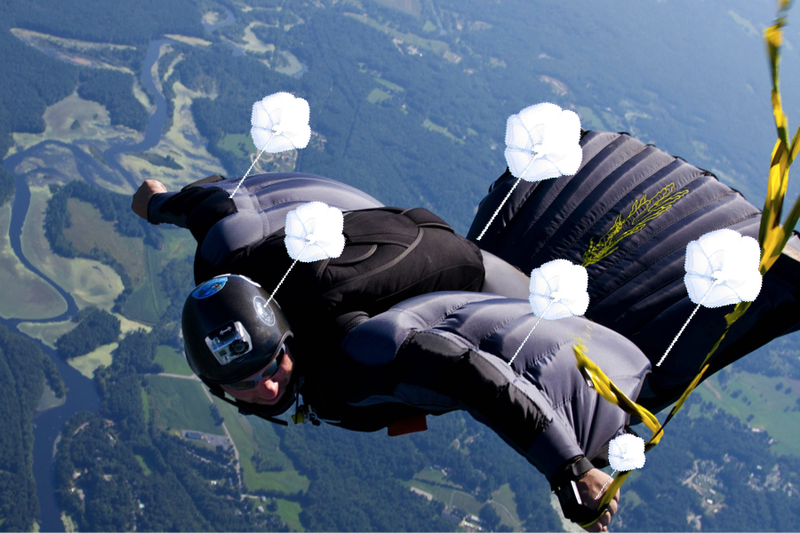 Performance wingsuit designers do not want their wingsuits flying like this purple flocker. They design them to be flown looking like this! Note almost complete lack of distortion; full pressurization, zero wing sweep and zero dihedral. If you want to fly at maximum performance, start by eliminating all pilot-induced distortion! Well, there’s a catch. Wingsuit pilots also want flight stability, which is the property of our wingsuit to stay where we tell it. Taking this one step further, stability is also a measure of our wingsuit’s ability to return to its original state if it gets bumped away from where we want it. One of the reasons tandem instructors use a drogue chute in freefall is to add stability, not just slow their terminal velocity. Tandem freefall stability is enhanced by a drag-generating drogue chute. Stability for aircraft (and wingsuits) is created via the same principal. It’s just not as obvious. For us, stability is achieved via isolated regions of drag acting as micro versions of tandem drogue chutes on different points of our wingsuit. These drag regions increase in size depending on how much you distort and deflect your wingsuit, head, chest, knees, etc. Your brain acts as a flight computer to collectively balance all distortions keeping you stable on all three axes… Pitch, Roll and Yaw. Stability is a good thing. A very good thing. 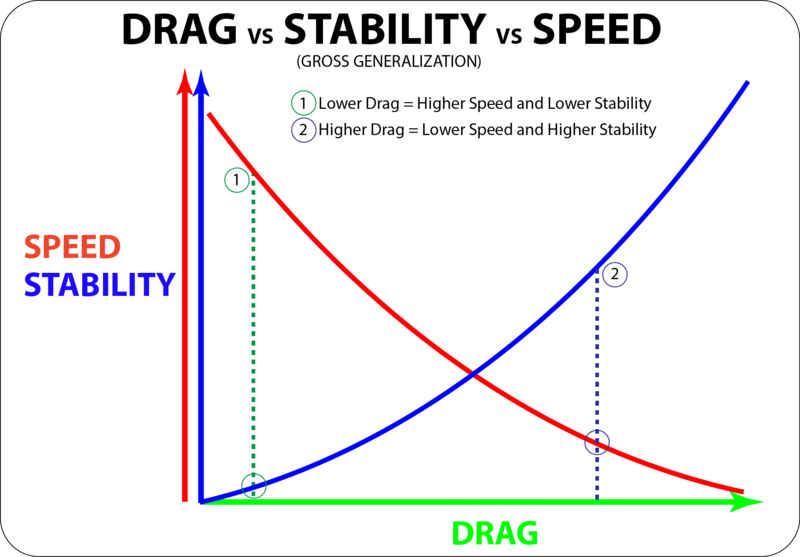 However, more stability generally requires more drag. And drag kills speed. You can’t have everything. Have you ever eaten a face full of asphalt getting ‘speed wobbles’ on a skateboard? You’re bombing a hill, trying to go as fast as possible, leaning into it, tucking everything in. Everything’s great until you hit a certain critical speed, get an unexpected bump, and your board starts violently wobbling back and forth until you go flying. This is an example of losing stability at high speed. The same effect can happen with wingsuits, in any axis, so be careful! Our new favorite term, Dihedral, is great for roll stability, as discussed earlier. 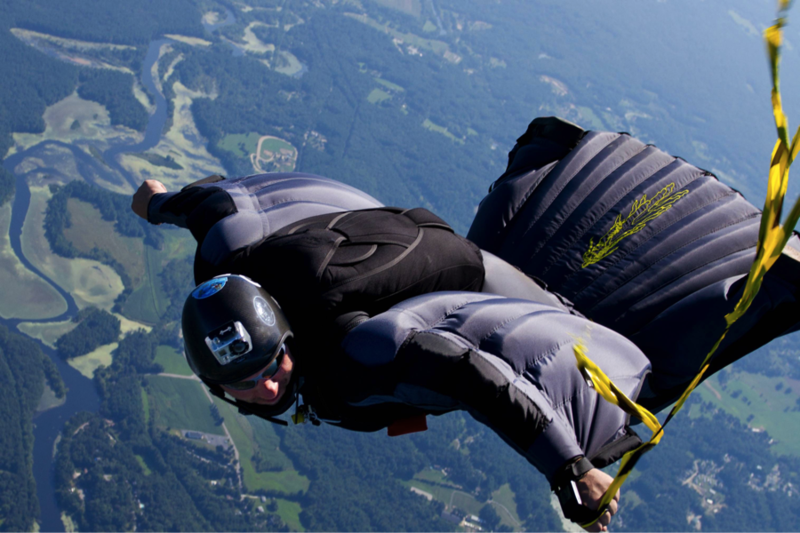 For wingsuits, dihedral is also great for pitch stability in dives. 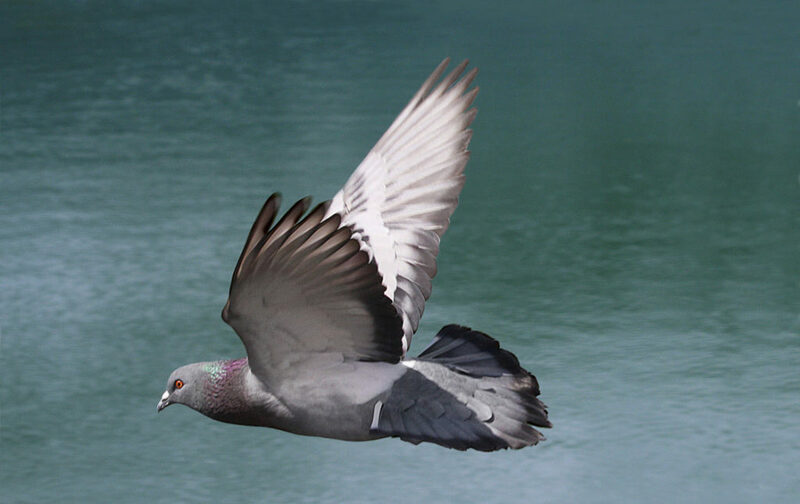 Flying with dihedral (think gliding pigeon) spills lift from your arms and allows your flight path to get steeper. 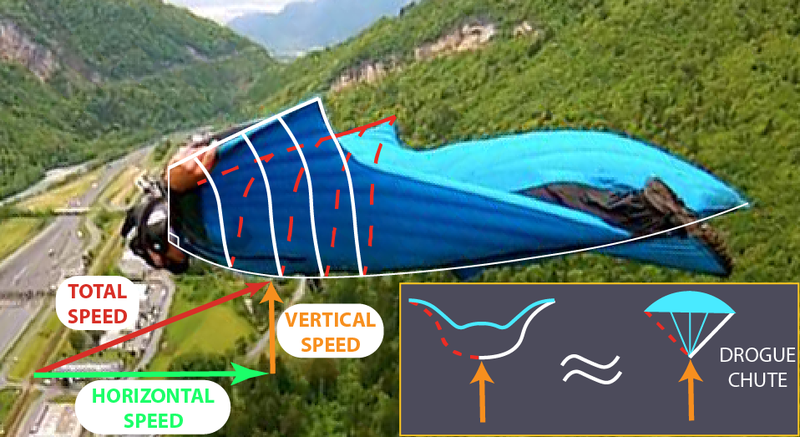 Relative to your now-steeper flight path, the cross-section of your wingsuit resembles a nuanced shape of a drogue chute, creating drag, and thus, improving pitch and roll stability (less pitch and roll wobbles). Flying steep lines using this exaggerated dihedral has been very popular in recent years. It is a remarkably stable configuration. However, there are some other techniques presented in Part 3 that, with practice, allow for a much more efficient flight profile, increased Available Lift, and higher speeds. Be warned: These benefits come at the cost of pitch and roll stability, so be prepared to train and practice! 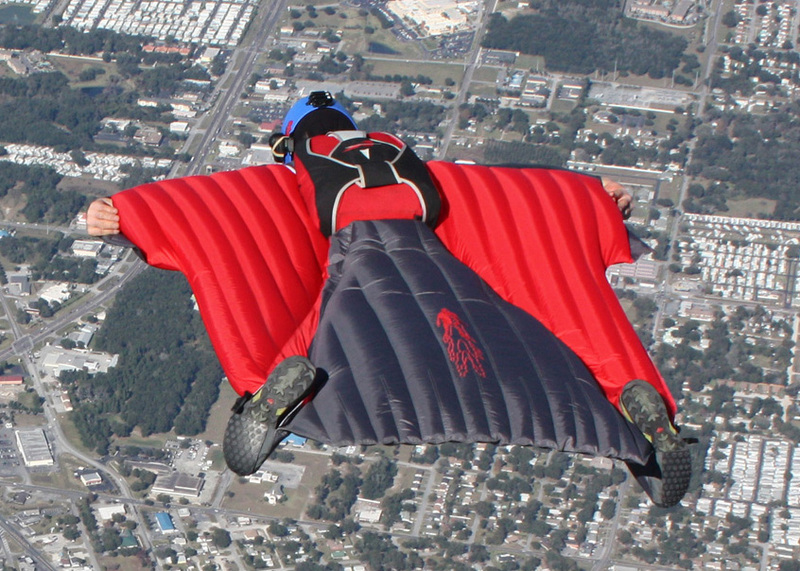 Bottom Line: Dihedral helps prevent speed wobbles in roll and pitch for wingsuits. Dihedral also increases drag. Which kills speed. Again, nothing comes for free in aerodynamics. An astute and educated reader may notice an interesting omission concerning my approach to speed. By my count, I have only mentioned angle of attack (AOA) once to date on my blog. This omission is absolutely 100% intentional. AOA is a truly complex and nuanced variable even for fixed-wing pilots… meaning airplane pilots. Trying to convey AOA as it relates to flexible-everything wingsuits, well, I’ll be honest, I’m still trying to wrap my head around it, let alone explain it eloquently to you. There are too many distortion variables that need to be standardized and fixed first, before any semblance of numerical AOA discussion becomes relevant. Wingsuit experts way above my pay grade are having similar AOA discussion challenges. Trust me, we are working on this. For now, let’s put AOA on hold. There are plenty of other fundamentals that need to be solidly understood first. This is what I’m really talking about right now. Not vertical velocity, horizontal velocity, best glide, minimum sink, or any number of other airspeeds out there. ‘Total Speed’ on your Flysight (assuming zero wind) is just another term for terminal velocity. Terminal doesn’t mean absolute maximum possible. When talking about gliders and wingsuits, terminal velocity means the speed and direction you’re actually pushing through the air molecules at this very moment, in whatever wingsuit configuration or body orientation you happen to be in right now. It’s a fluid parameter, pun intended. The resistance of the air via friction on your wingsuit, combined with air pressure distributions over your body, stops you accelerating through the air molecules at some point. By definition, this is terminal velocity, whether you’re flying almost level or vertically straight down. Velocity is a vector parameter that defines speed in both a magnitude (size) and direction. 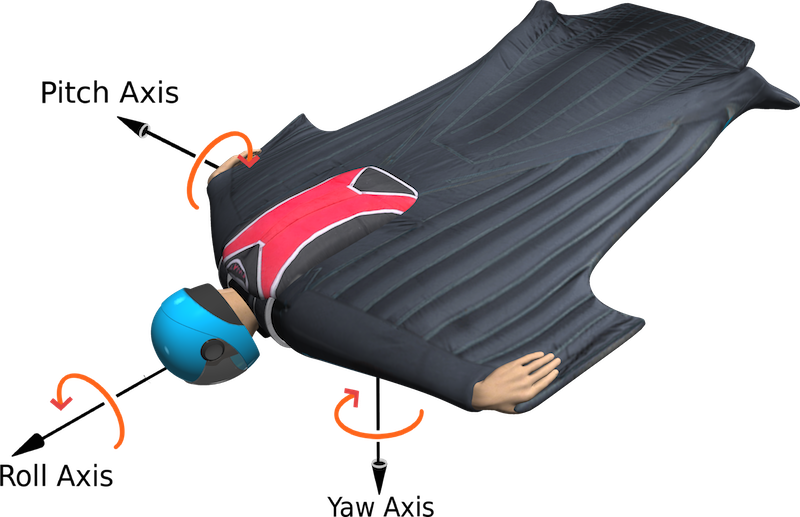 Change your wingsuit configuration or body orientation, and all friction and pressure forces equalize to a new terminal velocity (total airspeed and direction). Forget what you learned way back in AFF about terminal velocity meaning only straight down. The reason I’m hammering on terminal velocity right now is because our wingsuits are so inefficient, we have to take both vertical AND horizontal components of our wingsuit speed very seriously, not just horizontal. For example, diving at 1:1 glide ratio (45º flight path in zero wind) means 71% of our terminal velocity is vertical, and 71% is horizontal. Flying at 3:1 glide ratio (18º flight path in zero wind) means 31% of our terminal velocity is vertical, and 95% is horizontal. These are scary speed proportions, unlike any other human flying device today. These proportions scream HIGH DRAG and LOW LIFT. How fast can you get your wingsuit to move through the air in fully pressurized planform? Can you freefly in full-flight wingsuit position, fully tensioned, with perfect spine alignment to the relative airstream? Essentially, can you fly vertically straight down in perfect wingsuit position as if you were flying level? I can’t, not even close. I’m not saying you should be able to either. But our flight performance envelopes are so small (3:1 at best) that we HAVE to legitimately recognize that our terminal velocity is the real player, not just horizontal velocity. Here’s where I’m going with this. I firmly believe that in order to reach our goal of blistering horizontal speed, we need a 2-part training regimen. 1) Learn to fly in a controlled manner at your maximum terminal velocity in fully-tensioned full-flight body position with zero wingsuit distortion. This will be steep! Be prepared for instability. Don’t worry about what your horizontal speed may be. Focus first on maximum total speed (terminal velocity) in perfect position. Obviously, this training will be in the skydiving environment. 2) After mastering fully-tensioned zero-distortion maximum terminal velocity, we can start transitioning our maximum terminal velocity to a more horizontal bias. Working backwards from max speed on a drag polar curve (Gerdes will introduce this), we will intercept best-glide. Best-glide is that magical maximum ratio of lift-to-drag. It’s also only valid when flying in perfect, and I do mean perfect, body position. Tweak your toe pressure, change your gripper position, move your head, and your best-glide performance changes with your new configuration. It’s a nightmare combination of art and science. Honestly, we’re kinda screwed if you want specific numbers. We’re currently resigned to individual learning via extensive trial and error. However, there is hope. Legitimate, customized performance coaching is rapidly becoming available. Skills camps are emerging. Competition leagues are forming. Want to know how the big dogs are training? Matt Gerdes and other competition racers have developed various speed training techniques that are repeatable and proven. It’s all coming in Part 3. Please stay with us. Thanks! Looking forward to part 3! Love these posts!! Added your side to my favorites!! Looking forward to Part 3. Can you further explain the calculation of the terminal velocity vertical and horizontal components in the speed proportions bit? But honestly Loren? I’m guessing you already knew that! Use these two equations to get whatever you are striving for. Only challenge is how to spend least amount of kinetic energy to change the flight path to achieve whatever horizontal speed or glide ratio you are looking for. I fly hang gliders for forty, paragliders for twenty-six and wingsuits for four years. Your articles are by far far far the bests i’ve ever read in the BASE community. I just wanted to say a quick thank you. 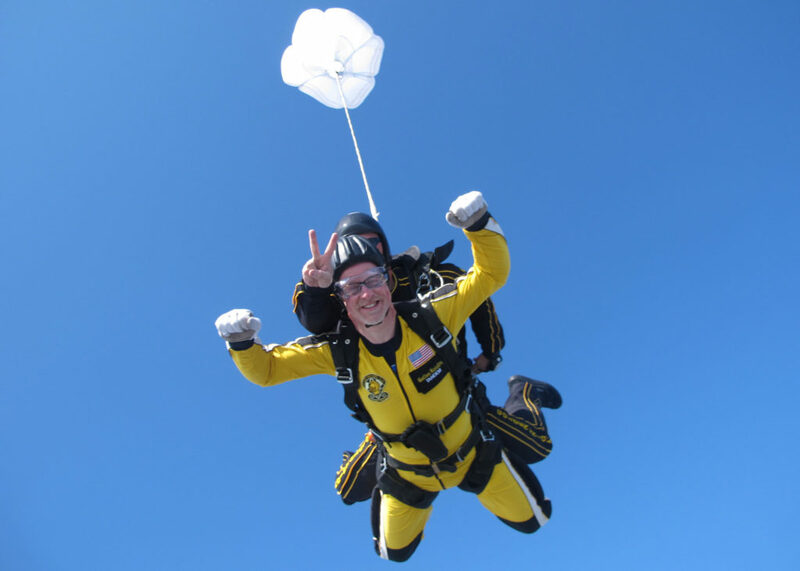 I have been a current skydiver, wing suit flyer and tunnel flyer for ten years now (I have no idea where that time went!) but I have always been shock by the lack of cerebral and objective information regarding any and all parts of this sport. I thank you for taking the time to help me stay focused, excited and curious. Great write -up! Thank you so much for taking time and effort to do this! Its incredible to think that it took this long, but its amazing regardless. Thank you for sharing your research and knowledge with the entire community. Everybody level up! THank you for sharing the knowledge!! !